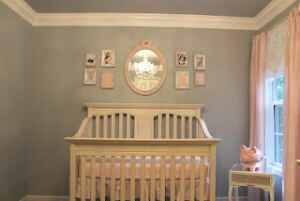 This baby girl nursery is lovely as can be and Mom isn't finished! There's more to come! 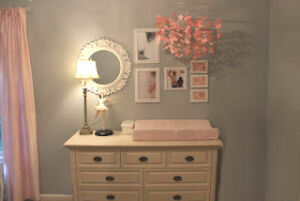 I love how soft and inviting our baby girl, Kelly's, sweet baby girl nursery project turned out. Her room that you see in the pictures show how far we have gotten but they are just the start; the finished design is going to be earth shaking! There are still improvements yet to be made that will make this the most stunningly beautiful space ever! We made the decision to forego the use of a crib bumper to avoid the creation of a possible suffocation hazard. Bumper pads continue to be a controversial item. This bed proves beyond a doubt that not a smidgen of style is lost if you would prefer not to use one. In fact, I didn't even notice that there wasn't one in place at all since my eye was drawn to the contrast of the ceiling and wall paint color. The light and airy butterfly ceiling mobile adds a touch of soft color in the changing area of this soft pink baby girl nursery design and blends so well with the photo collage. Let's take a closer look at the photos included in the wall arrangement. 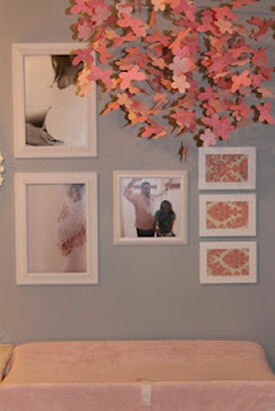 The collection of photos over the changing table include shots from Kelly's maternity portrait shoot as well as frames currently filled with pink and ivory damask print fabric that will hold pictures of baby when she arrives. Are you curious about how a big word (for me) like "serendipity" made it into the title of this article? I was almost afraid to include it for fear of sounding like one of those horrible content pieces that are spun until they've used every word in the Thesaurus. But being as Kelly's blog is called Searching for Serendipity and her baby girl, Nicolette, is the fortunate stroke of serendipity that they waited two long years for; how could I not? I hope that you enjoyed their baby girl nursery ideas and that you will leave a comment to let Nicole, the decorator that is responsible for this sweet baby girl nursery design, know what a great job she did. It would also be nice if Unique Baby Gear Ideas' visitors would jump over to her blog and congratulate her and her husband on the birth of their daughter! Kelly, could you direct me to a tutorial or tell me how to make a butterfly baby mobile like yours? It is so precious and I want to make one like it but I don't have the money to buy one of those expensive Cricut machines. Where did you find the furniture? I'm looking for something very similar for my baby girls nursery. I love this!! What are the paint colors? My daughter is expecting, and we love this room. Can you please tell me what brand furniture that is? I abolutely lovvvvve it! Where did you get that chandelier? It's stunning. This is really by far one of the most elegant nurseries I have yet to see! Do u know the name and brand of the paint color? This is by far what i am basing my nursery on! This is the prettiest pic i have seen yet! Do you happen to know what color and brand the paint is? Does it look greenish in person? What an elegant and relaxing looking nursery! What a sweet nursery! Perfect for a little baby girl! awesome kelly! i love it, but wouldn't expect anything less from you! Love it! Very classy with a touch of whimsical! 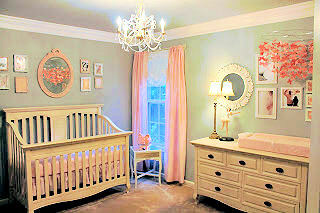 This is the perfect Room for a sweet baby girl! Kelly is a detail oriented young woman and all of the details came together in the creation of this beautiful room. The photos don't do it justice. There is a palpable sence of peace when in this room. Kelly is a detail oriented young woman and all of the elements came together in the creation of this beautiful room. The photos don't do it justice. There is a palpable sense of peace when in this room. Somehow, I believe pieces of this nursery have been in the planning stages in Kelly's mind since she was about 5 years old. It's just what she does. Such a beautiful space! Congrats mama and papa! I've seen this one in person, and the pictures don't do it justice. Plus, Kelly painted the inside of the closet pink! They didn't want a "pepto pink" nursery, but the closet pink adds that extra little flair for a little girl's room! Part of what makes this nursery so sweet is the attention to detail! Pics of mom and dad's expression when there found out she was a "she" and belly pics all framed above the changing table - so perfect! This nursery is amazing!! Great job mama! Beautiful job Kelly. We're pulling for you to win this contest and anxiously awaiting the happy news that your little princess has arrived. The nursery is absolutely beautiful!!! !